John D Cogan is an American painter, born 24 February 1953. He currently resides in New Mexico with his wife Karen. John works almost exclusively in acrylic on canvas or panel, capturing the splendor of creation in the landscapes of the American Southwest. His style is unique consisting in thin underpainting and thicker finishes as well as glazing and scumbling and attention to detail. His focus is on color and the transient effects of light. John earned a PhD in physics from Rice University in 1981. But finding more personal fulfillment in painting, he made it his lifelong vocation in October 1982. The Grand Canyon has been one of John’s favorite subjects and he has painted it hundreds of times in all seasons and weather. He has participated in the Grand Canyon Association’s Plein Air on the Rim from 2009 through 2017 as well as the 2009 Modern Masters show at Kolb Studio. In 2012 John’s painting “Out of the Depths” won the Jack Dudley Memorial Purchase Award and is a permanent part of the collection of the Grand Canyon. In 2015 John won Best of Show. He has also spent time on both the North and South Rims as Artist in Residence. Zion National Park is another of John’s favorite painting destinations as well; its quiet beauty and cathedral-like setting have inspired many of his best paintings. 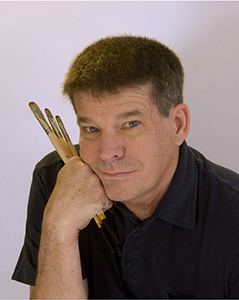 He has participated in Zion National Park’s Plein Air Invitational from 2010 through 2017 winning multiple awards as well as the Superintendent’s Award in 2011 and 2017, and the Foundation Award in 2015. His painting “Waters of Evening” was used as the poster painting in 2016. The recent book, Art of the National Parks features John’s paintings in the section on Zion National Park. John has won numerous awards and his paintings are part of the permanent collections of the Grand Canyon, Bernalillo County, Citizens Bank, Conoco Phillips, McGraw Hill, San Juan College, Eastern New Mexico University, Raymond James Financial, Xanterra, Zion National Park, among others. John has 27 pieces in the collection of the Sultanate of Oman.